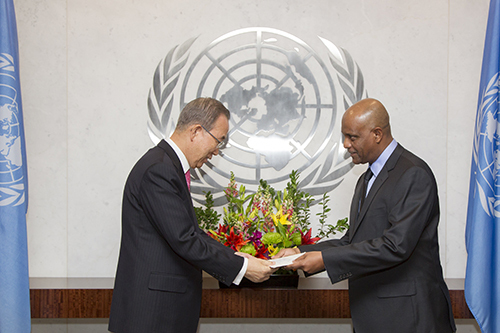 The new Permanent Representative of Comoros to the United Nations, Soilihi Mohamed Soilihi, presented his credentials to UN Secretary-General Ban Ki-moon today. Prior to his appointment, he was Director General of the Office of Radio and Television of the Comoros, since 2010. From 2009 to 2010, he was Political Counselor of the Minister of Foreign Affairs. He also served as Chief of Staff of the Minister of Finance, from 2007 to 2009. A Special Delegate to Moroni City Hall from 2006 to 2007, he also held the position of Secretary General of the Government of the Island of Ngazidja from 2004 to 2006. Mr. Soilihi worked in education, including at the Skills Assessment Center in Mayotte, France from 2002 to 2004, where he was in charge of evaluation-orientation. Between 1998 and 2002, he was a trainer in intercultural approaches to social institutions and organizations in the Provence Alpes-Côtes d’Azur region, France. He also held various positions in media, primarily as a correspondent for Radio France International from 1990 to 1996. Concurrently, he served as Director General of Radio Comores from 1992 to 1993 and Press Attaché at the Office of the President of the Republic of the Comoros from 1991 to 1992. Mr. Soilihi studied Political Science — Communication and Development at the University of Aix-Marseilles, as well as Political Science and International Affairs at the Institut d’Etudes Politiques, University of Aix-Marseilles. Born in Moroni, Comoros on 1 January 1964, he is married and has three children. to H. E. Mr. Ban Ki-moon, Secretary-General of the United Nations (05 November 2014). The Ambassador is appointed by the President of the Union and presents his credentials to the countries of representation, in accordance with the practice defined in the Vienna Convention on Diplomatic Relations. We hope that you will find useful information on this official site of the Permanent Mission of the Union of the Comoros to the United Nations in New York. This diplomatic mission is also accredited to the United States, Canada and Cuba. The embassy has a separate web site dealing with consular matters and bilateral diplomatic relations.